Mystic Marriages – Zero Equals Two! The Alchemical Great Work is a process that reduces a given thing to its constituent parts, purifies them, and then brings them back together to create “The Philosopher’s Stone.” While this is a grossly oversimplified explanation of a topic that extends back to our earliest recorded experiments, it’s a useful enough summary for a blog post. I think. The process of creating the Stone from the purified parts has been depicted in many ways over the centuries. 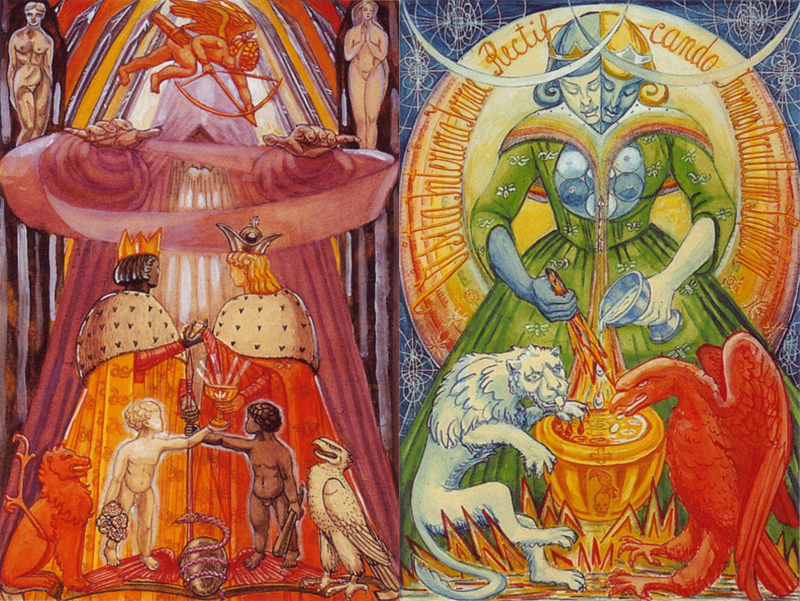 My favorites are the ones where a King and a Queen are buried together in a tomb and arise as a Holy Hermaphrodite, a two-headed being that contains the individual and unique properties of both Queen and King, but are now unified into a new creation. The symbolism can be found in Eliphas Levi’s image of Baphomet, a being with both breasts and a ginormous phallus, indicating that the entity contains the powers of generation, creation, and manifestation within itself. In the Thoth tarot deck, we find Alchemical imagery in many of the cards. An argument can be made that they all show various stages of the Great Work. The Eight of Wands shows the Sun and the Moon united, referencing the opening lines of the Emerald Tablet of Hermes, and representing the path of Samekh on the Tree of Life, perhaps. I’m probably reaching a bit to point out that the 8’s are all of Hod, the sphere of Mercury, and that this card implies that the actions of Hod should result in the unification of Tiphareth and Yesod. Fortunately for me, there are a couple more obvious references that can be seen in the trump cards of the Lovers and, of course Art. In the Lovers card, you see the images of the unification of apparent opposites coming together under the auspices of a nebulous higher power. The Lovers are attributed to path 17 of the Tree of Life. The Hebrew letter of this path is “Zain,” meaning a sword. In this card, the lovers are still separated. The process demonstrated could be interpreted to indicate that the preparation of the two opposites, the purification of those aspects of the materia that later becomes the Philosopher’s Stone requires the application of the Sword. Swords represent air, the intellect, the mind, and the thoughts. Applying the sword of the mind to the purification of things prior to union is key to the accomplishment of the Work. In some alchemical formulas, the purified pieces and parts of the whole are brought together to decay and become something new. Whether this is the purified Queen and King buried in a tomb to transform into the Holy Hermaphrodite, or metals or powders combined under various exposure to heat depends a lot on your approach to the process. At the end, you have an amalgam of the metals that you spent all that time purifying, or a unified being capable of creating amazing results. Wealth, health, strength, joy, and the accomplishment of whatever it is that makes you get out of bed yet again. The Art card shows what happens after the separated and purified ingredients are recombined. The entity in the card is the Holy Hermaphrodite. The unique qualities of both halves are still notable, but they are working together now. In the Lovers card, the opposing elements are facing each other, separated. In the Art card, they are combined, and are a new creation. That creation is seen mixing apparent opposites together to create the world. The process of unification is designed to create a creator. Applied to the self and the changes we go through in life, we can see that a lot of what we do early in the Work involves sorting out who we are. Learning a classification system, like the Tree of Life, or the columns of 777 so we have a framework to separate our motivations, our intentions, our desires, and our actions. We can separate and evaluate our bits and pieces, and work on purifying each little part of ourselves until they are ready to be put back together into one useful thing. It’s a process, in my opinion, that we never really finish. But along the way, we do get better. We clean up the bits and bytes, and recompile them into an application that can be used to create new stuff, or to clean up other parts of ourselves so we can then learn to create new stuff. I think the most interesting thing about this subject is that when you are “finished” with one part of the Work, and you have created the Holy Hermaphrodite, or the Philosopher’s Stone, you’ve basically started with a lump of material, separated it into its component parts, purified them, and then put them back together again in a way that is more useful for you. You end with the same stuff you started with, but it’s cleaner. It’s more pure. It can be applied to solve your own problems, and those of the world around you. If we assume it’s an allegory for self development, you aren’t any more you at the end of the Work than you were when you started. You just unpacked yourself and put yourself back together again in a way that’s more efficient at manifesting your Will. I also really appreciate that the end product is neither male nor female. The Unified being, the resultant entity that arises from the Mystic Marriage is one entity, and they are now capable of creating the World. That’s the power we release with this whole process. Or at least, the one that I think is the coolest. But it’s a power we already had. The Work just showed us what we are capable of accomplishing, when all the pieces and parts are working together towards the common goal.